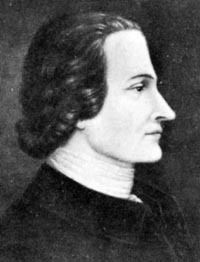 George Taylor’s birth date is uncertain, but most writers believe that he was born in 1716 in northern Ireland, the son of a Reverend Taylor. Little is known of George’s growing up years, but based on the reading and writing skills he brought with him to the colonies it seems likely that he had received a good basic education in Ireland. Taylor emigrated to the colonies as an indentured servant in 1736, when he was 20, with his passage paid for by Samuel Savage, Jr., an ironmaster at Coventry Forge near Philadelphia. Taylor would later become one of three signers of the Declaration who were born in Ireland, the others being James Smith and Matthew Thornton. At first George Taylor was employed by ironmaster Samuel Nutt as a “filler”, shoveling coal into the furnace when in blast. Recognizing Taylor’s other skills, Nutt soon appointed him to his counting room as a clerk at Coventry Forge. Nutt died soon after, in 1737, and in accordance with his will, left his iron and furnace properties to Samuel Savage, Jr. and Savage’s mother, Anna Rutter Savage Nutt. Samuel Savage, Jr. died, in 1741. A year later, in 1742, George Taylor married his widow, Ann Taylor Savage (her maiden name had also been Taylor). At this point Taylor took over the management of Warwick furnace and the business grew and prospered over the next few years. Ann Taylor’s grandfather, John Taylor, came to Pennsylvania from Wiltshire, England in 1684 and became surveyor General of Chester County, which then accounted for about one-third of the colony. Later, her father, Isaac Taylor, served as Chester’s Deputy Surveyor General. Ann’s family belonged to the Society of Friends, but she was disowned as a Quaker in 1733 for her marriage “outside the circle” to Samuel Savage, Jr.
As the first known example of his public service, Taylor was appointed a captain of Chester County Associators in 1747, a militia group formed by Benjamin Franklin to provide security against frontier violence. In 1752, when his step-son, Samuel Savage III, came of age, Taylor stepped down from the management of Warwick Furnace, turning the Furnace over to Samuel III in accordance with the will of Samuel’s deceased father. While Ann gave up control of the Furnace to her son, but she kept a life right to two farms and the Taylors stayed in Chester County a few more years. Ann and George Taylor had two children, a son James who was born at Warwick Furnace in 1746 and Ann, a daughter who died in childhood. About 1753, Taylor and a partner, Samuel Flower, leased the Durham Iron Works for five years with an option to lease an additional five years. The Taylors moved to Durham and lived in the mansion house on the property. During this period, the Furnace produced cannon shot for the Provincial Pennsylvania Government for the French and Indian War. Taylor became active in public affairs and was commissioned as a justice of the peace in 1757 and again in 1761 and 1763. He was also involved with the Red Hill Presbyterian Church, serving as a trustee in a 1765 land transfer for the congregation’s burial ground, now known as Gallows Hill Cemetery. While living in Durham, he bought a small stone house in Easton, PA at a sheriff’s sale on December 23, 1761 for Â£117, 15 s, 10d. The house was located at the northeast corner of what is now Northampton and 2nd Streets. He also bought the lot across the street at the northwest corner and built a stone stable there. The Taylors moved in when the Durham lease expired in 1763 and lived there approximately five years. In 1765, they bought a house nearby on Northampton Street for their son, James, and conveyed it to him for 5 shillings and “their natural love and affection”. In Easton, Taylor soon became involved in public affairs. He took an active role in the building of the new courthouse and, according to some accounts, supervised its construction. Taylor was a justice of the peace in Bucks County from 1757 to 1763. Taylor was elected a member of the Provincial Assembly from 1764 to 1769 and was commissioned as a Justice of the Peace for Northampton County during the years 1764-1772. In 1774 he was commissioned by the governor to administer oaths of office to new Northampton County officials. In March 1767, Taylor purchased a 331 acre tract known as the “Manor of Chawton” located approximately 15 miles west of Easton. There he built an impressive two-story Georgian stone house on a bluff overlooking the Lehigh River. He hired carpenters from Philadelphia to erect the home in 1768. This home still stands, identified as the George Taylor Mansion. Tragically, his wife Ann died that year. It is not known where she was buried. Among the possibilities suggested by historians are the new property, in Easton, and the Gallows Hill Cemetery. Taylor leased most of the property out in 1771 and in 1772 appears to have been living with his son, James, who had moved to what is now Allentown, PA.
Taylor returned to Durham in 1774, having entered into a five-year lease with Joseph Galloway, the owner of the Durham Iron Works, leasing mines, quarries, forges, and blast furnaces in PA and NJ. At the time Galloway was a prominent Philadelphia attorney and speaker of the Pennsylvania Assembly. The production of the Iron Works included pig iron and bar iron made at the forges in New Jersey, castings, and stoves, including Franklin stoves. In August 1775 Taylor secured a contract from the Pennsylvania Committee of Safety for cannonballs. From 1775 to 1778 Durham Furnace produced grape shot, cannon balls, bar shot and cannon for the Continental Army. Taylor received limited compensation for his contribution to the war effort, and his wealth diminished as a result. At the July 1775 meeting of the Assembly, a month after the Battle of Bunker Hill, Taylor was commissioned as a Colonel of the 3rd battalion of Militia. This meeting represented the first step in the county arming for conflict with England. He reportedly took part in drilling and in the organization of the battalion. With changing public sentiment, those instructions were rescinded in June 1776. When several delegates, including John Dickinson, chose not to vote in favor of the Declaration of Independence on July 4, the Assembly chose five replacements on July 20. They were George Taylor, George Ross, George Clymer, Dr. Benjamin Rush and James Smith, all of whom joined Congress and subsequently signed the Declaration of Independence when the engrossed copy of the document was ready for signatures on August 2, 1776. Later he served on the committee that drew up resolutions calling for states to raise troops. In January 1777, he was selected by the Congress to arrange and preside at the Indian Treaty Conference in Easton, PA. In March, he was elected to the new Pennsylvania Supreme Executive Council but retired shortly thereafter due to illness. Taylor’s lease of the Durham Iron Works continued through 1779. The property was then seized because Joseph Galloway, the owner, had been attainted of treason for siding with the British. An attempt was made to evict Taylor but the Supreme Executive Council allowed him to remain until the end of the first 5-year term of the lease. The Durham property was then sold by the Commissioners of Forfeited Estates and purchased by four colonels: George Taylor, Richard Backhouse, Isaac Sidman and Robert Hooper Jr. Backhouse took over management of the Works, and Taylor moved to Greenwich Township, NJ to lease and operate the Greenwich Forge in Warren County, New Jersey. In early 1780, Taylor moved back to Easton, PA. He had sold his estate along the Lehigh River in February 1776 and his house and stable on Northampton Street in Easton in 1779. He leased a stone house at the corner of Fourth and Ferry Streets. George Taylor died in February 1781, His estate included two slaves, Tom, who was sold for 280 bushels of wheat valued at Â£77 and crippled Sam who fetch Â£15, one horse and three cows, and a 24-hour eight day clock with a walnut case valued at Â£24. After bequests to his executors and housekeeper he left in his will dated January 1781 half of his estate to his five grandchildren, George, Thomas, James, Ann and Mary, his son James having died in 1775. The second half of his estate was left to the five children Taylor fathered with his housekeeper, Naomi Smith: Sarah Smith, Rebecca Smith, Naomi Smith, Elizabeth Smith and Edward Smith. Under his will the executors were instructed to be guardians of these children until they were 21, providing for their maintenance and education. The children were to be kept by their mother until 10 and then placed out. His estate was settled 19 months after his death, but its value was minimal. The settling of the partnership account for the Durham Iron Works took longer and it was eventually found to be insolvent. Taylor was buried in St. John’s Lutheran Church cemetery across from his residence at Fourth and Ferry Streets in Easton. The house he leased in his final days is now known as the Parsons-Taylor house. When the church property was sold in 1870 for construction of a public school, Taylor was re-interred at Easton Cemetery. In 1854 local residents erected an impressive monument made of Italian marble in George Taylor’s memory at the Easton Cemetery. In April 1870, his body was removed and re-interred in front of the monument. Three of the houses in which Taylor lived remain standing. The stone house he purchased in 1761 at 2nd and Northampton Streets in Easton is known as Bachman’s Tavern. The Parsons Taylor House, at the corner of Fourth and Ferry streets in Easton, is owned by the George Taylor Chapter of the Daughters of the American Revolution. It was built by Easton founder William Parsons in 1753 and is today the city’s oldest house. It has been owned by the DAR chapter since 1906. The George Taylor House (formerly the Manor of Chawton) is an impressive two-story Georgian stone house with symmetrically paired brick end-chimneys and a gable roof with flattened ridge. The house and five acres of land were acquired by the Lehigh County Historical Society in 1945. In 1971 it was listed on the National Register of Historic Places. The House has been carefully restored and is open to the public. It is located at 35 South Front Street in Catasauqua, Pennsylvania. An anonymous admirer had this to say about Taylor: George Taylor was one of the brilliant and forceful men of his time, an earnest and ardent patriot in the trying times of his adopted country’s needs, a fearless and able legislator seasoning every act of his long public career, by hard robust, conservative common sense. He seems to have been held in high esteem by those with whom he was associated in the public service and his advice was frequently sought as to public measures. My Grand Mother Flossie Keough (Taylor- maiden name) was born in the 1890’s and was a member of the Daughters of the American Revolution. The Taylor’s were considered some of the first settler’s in NW Ohio (Just outside Swanton, OH) after the Revolution. They were given over a square mile of land and she talked of George Taylor on a regular basis being a family member. I find it ironic that her son Robert Keough created a successful Heat Treat Ironwork’s plant. Bradley, I suspect Flossie’s Taylor is not descended from George Taylor, the Signer. We have no records that any descendants of the Signer were ever in Ohio. I also checked http://www.dar.org and found that of the eight deceased DAR descendants of George Taylor, the Signer, none had a name close to Flossie Keough or Flossie Taylor. This leads me to believe that your Grandmother’s DAR was for another George Taylor. The DAR has three other patriots named George Taylor from PA. I suspect that Flossie’s DAR membership is through one of those patriots. The DAR link is http://services.dar.org/public/dar_research/search_adb/default.cfm . Of all the DAR descendants of any of the George Taylor possibilities, only this one, 106222 Kehew, Fannie Taylor comes close. There is the problem with Kehew vs keough and Fannie vs Flossie, but nothing else seems to work. 106222 is the national DAR number. If you do not have her copy of her DAR record, you can purchase it from the DAR site. To add some clarity, Brad (my father John’s first cousin) and I are not direct descendents of George Taylor, but one of his brothers. Our connection is Frederick Taylor who emigrated to the US from Ireland in 1783. I don’t have all of the documentation further back on his side (versus his wife’s, who we can trace back to NJ in the 1660s), but verbal family history and what I do have written down together suggest that Frederick was probably a grand-nephew or great-grand-nephew of the signer George Taylor. My great-grandmother Flossie’s DAR status was likely, as you suggest, from another path.